The Centre has sought a detailed report from the Mamata government on the circumstances leading to the violence and the steps taken to restore peace and punish those involved in the violence. 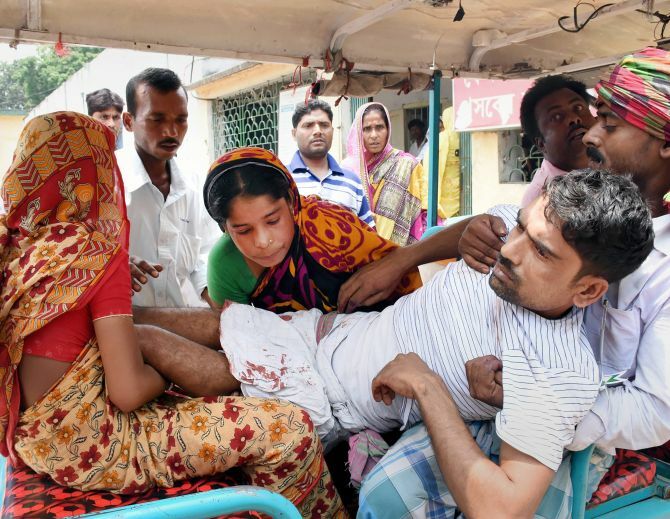 Widespread violence during the panchayat polls in West Bengal today left at least 12 people dead and 43 injured, as 73 per cent of the electorate turned up to cast their vote. Additional Director General of Police (Law and Order) Anuj Sharma told reporters that there were reports of 12 deaths but only six of them have been confirmed to be poll-related. "We are looking into the cause of six other deaths," he said. 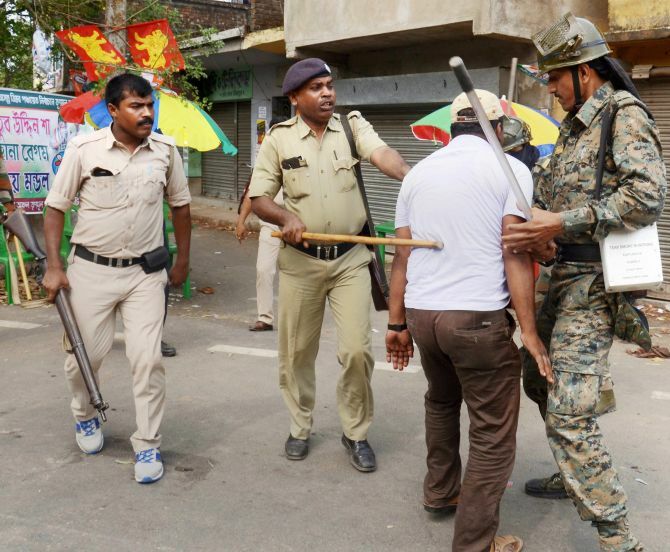 Notwithstanding the elaborate security arrangements in which 60,000 security personnel from West Bengal and other states were deployed, violence broke out in North and South 24 Parganas, East Midnapore, Burdwan, Nadia, Murshidabad and South Dinajpur districts as the polling progressed. State Election Commission (SEC) sources said 73 per cent polling was recorded till 5 pm, but many more voters were still in queue. 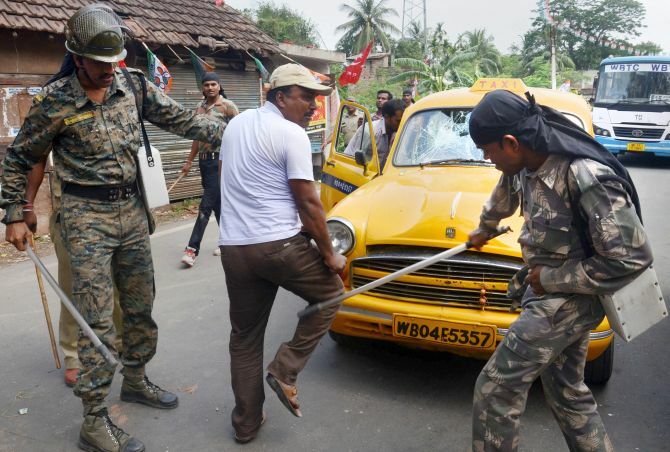 Polling booths were mainly targeted during the violence, following which clashes broke out between the ruling Trinamool Congress supporters and opposition party workers in several areas. Crude bombs were hurled near several polling stations. However, Director General of Police Surajit Kar Purakayastha said the number of deaths this time was less compared to the previous panchayat election, when 25 people died. He said three policemen were injured and 70 people were arrested in connection with the violence. ADG Sharma said TMC activist Arif Ali Gazi died in poll-related violence in South 24 Parganas. Two other TMC workers died in Nadia, he said. He said two Communist Party of India-Marxist workers died in Nandigram in East Midnapore district, while a Jharkhand Disom Party worker died in Kushmundi of South Dinajpur. Opposition parties have accused the TMC of ‘unleashing a reign of terror and destroying democracy’. "First they didn't allow people to file nominations. Second after filing nominations, TMC started threatening the candidates to withdraw. The people who didn't withdraw were attacked. This is nothing but a complete destruction of democratic process," CPI-M general secretary Sitaram Yechury said. TMC downplayed the violence, saying it was far less compared to the Left Front rule. ‘To all 'newborn' experts on Bengal #PanchayatElections in State have a history. 400 killed in poll violence in 1990s in CPIM rule. 2003: 40 dead. Every death is a tragedy. Now closer to normal than earlier times. Yes, few dozen incidents. Say, 40 out of 58,000 booths. What's %age? (sic),’ TMC leader Derek O’Brien said on Twitter. Earlier on Monday, the state police and the SEC gave a break-up of the incidents of violence and about the people who died. In East Midnapore, two persons were killed in Nandigram block-2 when bike-borne miscreants threw bombs on voters waiting in queue outside a booth, SP S N Kumar said. In another incident in Nandigram, 15 people were injured in a clash outside a booth. One person was hit on the head with a knife while another lost his finger, police said. An SEC official said that a man was shot dead near a polling booth in Sujapur village in Murshidabad. Local BJP unit leader Subhas Modal claimed the victim was a party worker. In South Dinajpur, a man was killed and four others were injured after a bomb was hurled outside a polling station, he said. One person was killed in clashes between two groups outside a polling booth in Nakashipara area in Nadia district, while another death was reported from Shantipur area, he said. The SEC official said bombs were hurled outside a polling station in Amdanga area of North 24 Paragans in which a man, said to be a CPI-M supporter, died and another injured. At Kultali in South 24 Parganas, one person was killed when a bomb was hurled outside a polling station, he said. In Cooch Behar district, North Bengal Development Minister Rabindranath Ghosh allegedly slapped a person outside a polling booth, the official said, adding that the SEC has received a complaint and asked authorities to take action. Television channels showed Ghosh slapping the person. He, however, claimed that he did not do it. In Dinhata area of the district, at least 15 people, including voters, were injured after clashes broke out between two rival groups outside a polling station, police said. In North Dinajpur, three crude bombs were found near a polling booth at Galaisura, police said. Of the three bombs, two were found on railway tracks, RPF sources said. In Birbhum, masked men carrying weapons and sticks were seen threatening voters outside some of the booths. Television footage from Basanti block of South 24 Parganas showed masked gunmen outside polling stations. 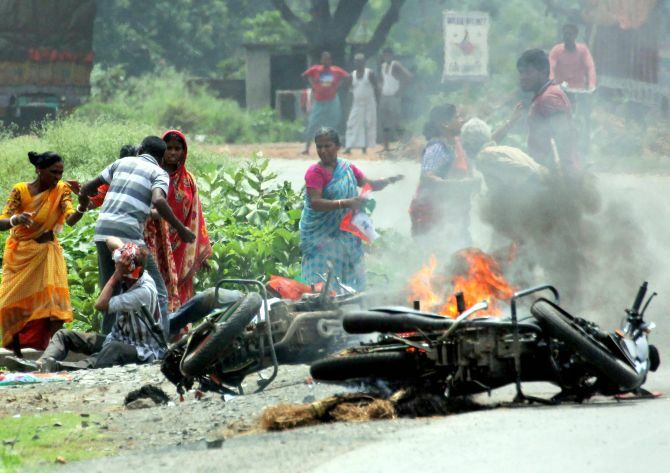 In Bhangar, which was rocked by pre-poll violence and saw the arrest of a TMC leader, police resorted to baton-charge and fired teargas shells to disperse people following clashes, the SEC official said. In Keshpur area in West Midnapore, police resorted to lathi-charge and chased people allegedly threatening voters. In Malda, the office-in-charge of Ratua police station Debabrata Chakraborty was injured in stone pelting when he went to remove a blockade on a state highway, S P Arnab Ghosh said. Chakraborty has been admitted to a hospital, he said. The panchayat poll is being held after a protracted legal battle in the Calcutta high court and the Supreme Court involving the SEC, the TMC and the opposition parties. Meanwhile, the Centre has sought a report from the West Bengal government on the violence. A home ministry official said the state government has been told to provide a detailed report on the circumstances leading to the violence and the steps taken to restore peace and punish those involved in the violence.